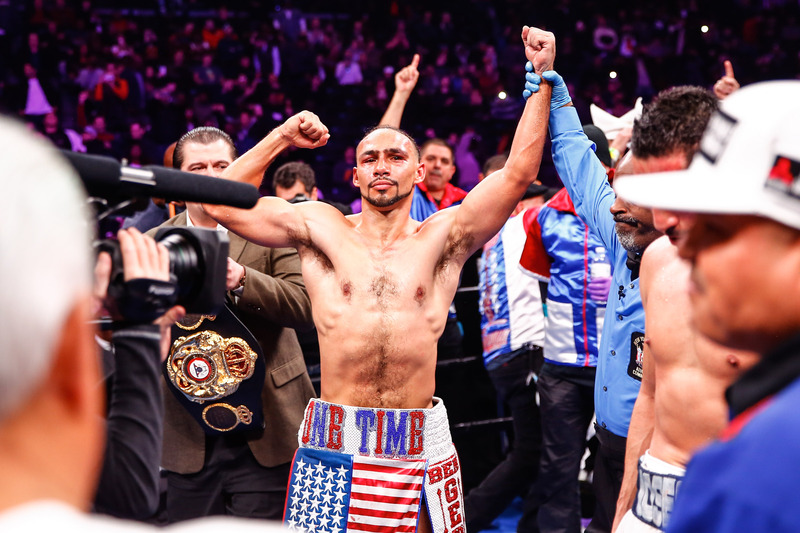 BROOKLYN (January 27, 2019) - WBA Welterweight World Champion Keith "One Time" Thurman returned to the ring and defended his title with a majority decision victory over veteran contender Josesito Lopez Saturday night in the main event of Premier Boxing Champions on FOX and FOX Deportes from Barclays Center, the home of BROOKLYN BOXING™. In his first fight in 22-months after elbow and hand injuries, Thurman started fast, landing a clean left hook on an exchange that put Lopez on the canvas with 15 seconds left in the second round. Thurman continued to move effectively and pick out power shots to Lopez's head. "My hand took some contact tonight," said Thurman. "Lopez had a tough head but we held out strong. I said you wouldn't see the best Keith Thurman tonight, but you'd still see a world class performance, and I gave you that tonight." "He had me buzzed and shaken up in the seventh round, but I tried to stay on the outside," said Thurman. "I was a little off in my prediction of how long his arms were. He lunged in and was really willing to commit to the knockout." "I definitely thought I held my own in that fight," said Lopez. "I had him hurt in the seventh round and I was landing a lot of clean shots on him." "I was disappointed I couldn't finish him and get him out of there," said Lopez. "If he thinks he's the best welterweight out there, then I want two through five lined up for me." Thurman ended the fight landing 247 punches to 117 from Lopez, and held the advantage in accuracy by landing over 27 percent of his punches to 23 percent from Lopez. Lopez's increased activity in the closing rounds helped him narrow the deficit on the scorecard, but in the end, the majority decision went to Thurman by scores of 117-109, 115-11 and 113-113. "I would most likely definitely take the Manny Pacquiao fight this year," said Thurman. "I feel good. That was a beautiful fight. I'm ready to fight wherever Pacquiao wants it. Either way, I will be back later this year. Believe that." In the co-main event, Brooklyn's Adam Kownacki (19-0, 15 KOs) continued his climb up the heavyweight rankings by earning a second-round TKO victory over former title challenger Gerald Washington (19-3-1, 12 KOs). "I trained hard for this fight," said Kownacki. "I prepared for 10 hard rounds, but I'm glad I got it done and ended it as fast as I did. We stuck with the game plan. I'm a pressure fighter. I worked on sitting down on my punches and I proved that I have great power when I do that."